There are many ways to learn about a composer. We can listen to his or her music, watch programs about them on TV, look them up on the internet. 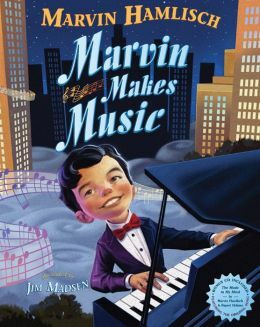 We can also read BOOKS about them, and I’ve found one I think you’re going to like, a picture book, about the American composer, Marvin Hamlisch. First, I want to tell you a bit about him. Marvin Hamlisch was born in New York City in 1944. He was an amazingly talented man, who started attending the famous arts school, Juilliard, when he was SEVEN! After he grew up, he wrote many, many songs, and he won many, many, MANY awards, including Emmys (for television music), Grammys (music), Oscars (movie music), and Tonys (theatre music). Very few people have won all four of those awards. The book I want to tell you about is the story of how he started out in music. Opening Sentences: Marvin was born to play music. He felt more comfortable on a piano bench than anywhere else. The piano was his best friend. Synopsis: When Marvin Hamlisch was a little boy, he loved to play the piano more than anything else. He heard music everywhere, not just on the radio, but also in the rain, in the noises on the street, in the sounds of a baseball game. He was a very special boy, because he could then make the music he heard in his mind come alive through his fingers on the piano. His parents knew he was talented, so they told him to practice hard, because he was going to have an audition to go to Juilliard, a famous school for musicians, dancers and other performers. He didn’t like practicing songs that someone else had written long ago, he liked to play his own music. And he was scared to play in front of other people. Somehow he had to find a way to be able to make his own music, while learning as much as he could. What do you suppose he did? 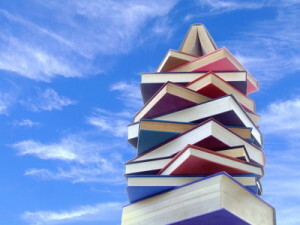 To find out for sure, you’ll have to read the book! Why I like this book: I like to know that even someone who became a famous musician like Marvin Hamlisch was nervous about performing – and hated to practice the piano! He’d even hide when he was supposed to practice, although he loved playing when it wasn’t practicing. It’s fun to learn special stories about famous people when they were kids, and find out they’re just like the rest of us in so many ways. Ev’ry note I hear rings true. The best part of all is that there’s a CD of this song in an envelope on the inside back cover of the book, so that you can learn the song and sing along with the kids on the CD. That makes this book even more special! On Marvin Hamlisch’s website, there’s a link to a video where he talks about what writing this book meant to him. I think you’ll enjoy it, and you’ll hear him play a little bit of the song. What a beautiful tribut to Marvin Hamlisch. How interesting he wrote the children’s book and did the video just prior to his death. I have been a fan of his work for years and seen him perform on stage at least three times. To discover how timid he was early in life is surprising because as an adult he was so comfortable with the audience. I loved how he interacted. There usually was a short segment in his concerts where he’d ask some to make something up and he’d write a song live on stage. He married a TV anchor I knew from Columbus. What a loss, but his music will live on forever!! Thanks so much for sharing his background and the wonderful book — a definite keeper! Oh wow — what a wonderful contribution your comment is, Pat! I love your story of his concerts. How amazing that he could write a song live on stage from something someone suggested! That would have been incredible to experience. Thank you so much for sharing! I’m quite sure you would like this book, Erik! Hope you’ll get a chance to read it. And I’m so glad to have “introduced” you to him. This book sounds terrific, Beth! I really want to read it. I love music and piano, and would love to see how Marvin is treated in a picture book. Thanks for sharing! Thanks, Susanna! I find it particularly cool that Marvin Hamlisch wrote the text of the picture book himself, so we know it’s true to life. I’m sure you’ll love it! I must look out for this. It sounds so interesting and I love autobiographical stories. Thank you for sharing. You’re welcome! I hope you’re able to find the book. The song on the CD is particularly a joy.